The Saab Gripen E Fighter has successfully completed the first tests to verify the ability to release and launch external payloads. The tests took place in October 2018 at Vidsel Test Range in the north of Sweden. 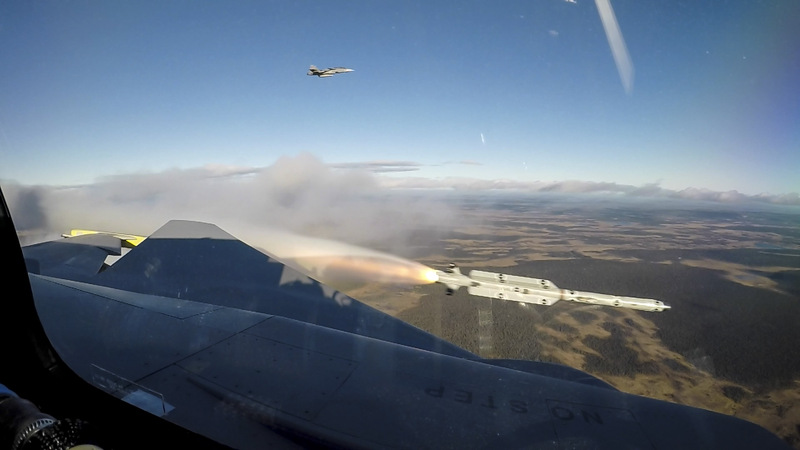 The tests, conducted by the first Gripen E test aircraft (designated 39-8), comprised jettisoning one external fuel drop tank and one firing of an IRIS-T Air-to-Air Missile. “I am pleased to see the aircraft behaving and performing according to our expectations, which is proof of its Smart Design and world-class engineering by Saab. The programme is on track, and we are making good progress in the programme towards delivery to our Swedish and Brazilian customers”, says Jonas Hjelm, Senior Vice President and Head of Saab business area Aeronautics. These tests are the latest steps in the Gripen E flight test programme preceded by the Carriage Trials in July and forms part of the Weapon Integration work. Gripen E has weapons for all types of missions, such as Stand-Off Precision Strike using Guided Glide Bombs, Heavy Anti-Ship and Deep-Strike Missiles, to Long-Range and agile Air-to-Air Missiles such as Meteor. Gripen E can also carry Pods and Sensors for Reconnaissance and Special Missions. To give Air Forces a wide choice of operational capabilities, Gripen E is designed to enable quick integration of various weapons. This is partly made possible by Gripen E’s flexible Avionic Architecture.